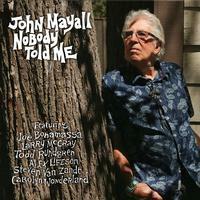 Iconic musician and Blues Hall of Fame member John Mayall presents Nobody Told Me; he's also celebrating his 85th birthday before the release of the album in February 2019. The 10-track LP features guest appearances from Alex Lifeson, Todd Rundgren and Steven Van Zandt, among others. It was recorded at the Foo Fighters' Studio 606 and co-produced by Mayall and Eric Corne, founder of Forty Below Records, which is releasing the LP. The record follows 2017's Talk About That and Three For the Road. "All my records are fun to make," he told AllAboutJazz.com in March. "It's very important to get it just right and have everything just where you want it to be. Once you record them and put them out, they're out there forever." He added that Nobody Told Me, which was at that point untitled, would be a "nice treat for the guitar freaks." "I felt it was time to once again feature the fire of an electric guitar," he said on his website. "This will be quite a historic move forward in that I have never before had a female lead guitarist in any of my numerous band lineups. She will make her powerful presence felt."